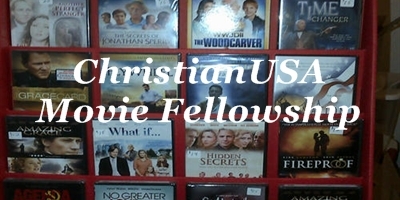 A ChristianUSA Movie Fellowship - What's New ? War Room: The Power of Prayer ! 1. None of us deserves Grace. 2. Satan comes to steal, kill and destroy. 3. GOD needs to be put back on the throne. 4. Submit to GOD and resist the devil and he will flea. 5. Pray to the LORD and let him fight your battles. This movie has many lessons to learn taught by a wonderful example. This newest offering from the Kendrick's Brothers, is an exceptional production with excellent acting. It even includes some well-placed humor which the audience will receive enthusiastically. Miss Clara will encourage you to make prayer more important in your lives.....GOD is loving and powerful and he will hear you ! The conclusion of this movie expands prayer outside the family and into the world beyond. Please watch and support this newest offering from the Kendrick's Brothers.. The trailer is below and click on the picture above to visit the website. Between now and the end of October, we expect to see three good Christian Movies coming to the theater. The first is "Woodlawn", which is another movie involving GOD and high school football. The Second is about the Christian rock band "Hillsong" which I expect to see a nice story accompanied by some excellent music. The third is "Captive" which is a story about a long-term-kidnapping in which both parties begin to consider the need for GOD in their lives. However, be cautious as it may not be appropriate or of interest to many Christian viewers. All three appear to be quality productions and more information can be found by visiting their websites. 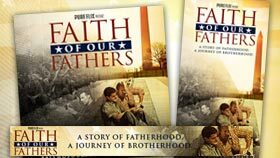 "A Matter Of Faith" & "Faith Of Our Fathers" !! On Tuesday evening June 24, 2015 we attended the movie in Providence R.I. It was a One-Night TUGG Event, and was certainly worth the ride. A "Rich Christiano Production" which starts off with a young lady going off to begin her college education. From a Christian family, things get rocky when young Rachel Whitaker starts her class in Biology taught by seemingly-legendary Professor Kayman. He is an evolutionist and wastes no time trying to mold the opinions of his students. When Rachel's Christian father learns that "Biblical Creationism" isn't even being considered as a possibility in her Biology class he quickly confronts the professor. This soon leads to a debate in front of teachers and students. At a disadvantage from the start, he receives some expected assistance from a former faculty member of the college. A nice story with an unexpected twist at the end. Kayman's class begins with the question: "Which came first the chicken or the egg?" The class as you can imagine does not respond in unanimity....Watch the movie to see their responses.. This was my first TUGG Event I ever attended. If you get enough enough reservations for a movie production it can be shown. You sponsor the event ....introduce the movie and even sell some materials. My wife and son bought the shirts below. Nice movie about the creation-evolution debate. The trailer can be viewed below and remember there are limited engagements for this movie and most appear to be one-night TUGG Events. Brought to us from Pure Flix Entertainment, this is a story of 2 men who embark on a journey that eventually brings them to The Vietnam Veterans Memorial in Washington D.C. Led through letters written by their fathers while fighting in Vietnam years before, the lives of these two men come to a crossroads... as they relive the experiences of their fathers years before . It's been awhile since I've seen it, actually about 2 years ago at the Christian Film Festival in Lawrence, MA., but I remember it as one of the top 3 movies shown that Easter Week. An excellent movie which then had the name, "To The Wall", is finally being released this week. Nice Christian message as one of the fathers is a believer who shares the message of the Gospel to the other during the horrors of war! Please locate a theater near you where this movie is playing and try to see it. Support the Christian Movie Industry and the sacrifice that our Veterans of war have made for our nation and it's citizens !! Unfortunately, I don't expect it to be shown at many locations. 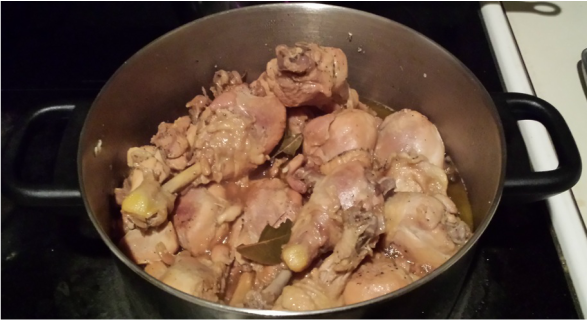 Click on the image above to find them..
2 Tablespoon Cooking Oil : olive oil works fine. 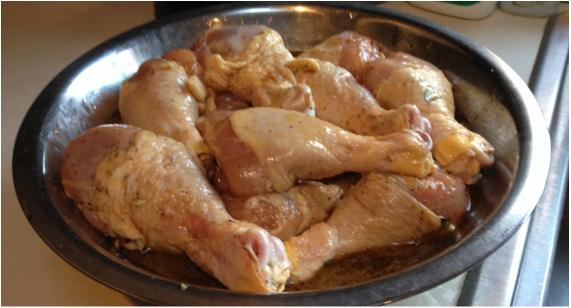 Wash the chicken with water, drain and combine all ingredients in a pot and let stand (marinate) for 30 - 60 minutes. Cook until it begins to boil then reduce heat to simmer. Cover while periodically mixing them for about 2 hours or until the meat is tender and sauce becomes thick. Salt to taste if needed. Pork can also be used . Complete the meal with Asparagus, carrots and brown rice......Eat and Enjoy !!!! Cooked and ready to serve !! LORD thank you for always providing !! “What do you think? If a man has a hundred sheep, and one of them goes astray, does he not leave the ninety-nine and go to the mountains to seek the one that is straying? And if he should find it, assuredly, I say to you, he rejoices more over that sheep than over the ninety-nine that did not go astray. Even so it is not the will of your Father who is in heaven that one of these little ones should perish." A wonderful movie with excellent acting, production quality and a story which could very well be the truth behind the well known Christmas Carol. Cherished at Christmas Vigil services throughout the world, the movie tells of the song written by a European Priest named Joseph Mohr who gets re-assigned to the small Austrian town of Obernforf. Father Joseph, who against the instructions of his superior, Father Noestler, struggles to restore the Church Choir and continue services in their native tongue of German. It is during these struggles and with the assistance of his church music director that he gradually composes the famous and beloved song, "Silent Night"! Wonderful, Counselor, Mighty God, Everlasting Father, Prince of Peace." Another quality production from David A.R. White and Pure Flix Entertainment! In this movie , Ted McGinley stars as Paul Tyson, president of a major American Security Company who takes on too much risk and threatens the financial viability of his firm and even his integrity. The need for a cash infusion leads him to a Brazilian Investment Company where he is introduced to a beautiful representative of BVCA-Brazil which further challenges his faith and even his his marriage. Popular Christian Movie Actor, Keven Downes, also has a strong role here and rounds out a strong cast. Excellent production, acting, and story built upon a strong Christian foundation makes this an excellent movie to see. One criticism, however, Christian Movies need to maintain a certain standard of Modesty. In this movie BVCA Rep., Julia Santos played by actress, Ana Ayora, dresses in a way that few would consider Modest !! There is no need for this and the Christian Movie Industry needs to draw a line in the sand and not follow Hollywood !! Notice that "The Free Exercise of Religion" was so vital to the drafters of the Bill Of Rights that it is mentioned FIRST !! Watch the movie and remember that "This Precious-GOD-Given-Right" in America is Under Attack!! "Be Watchful of Politicians With Smiles and Offers to Help With Other People's Money As They Slowly Erode Our GOD-Given-Liberties." Read more about the movie by clicking on the image above and view the trailer below. 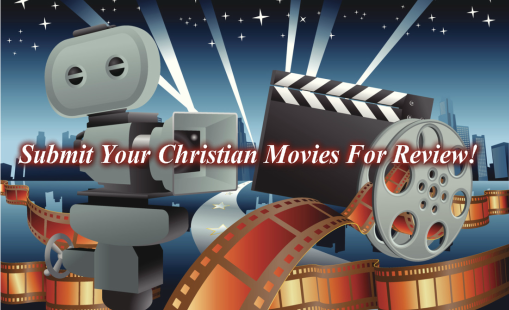 The movie can be purchased at Christian Cinema.com. The first Full-Length Production from "House Of Grace Films", "The War Within", is now available in DVD !! Following their 40-minute First film "The Board" , the six members of the Inner soul return namely,"Mind, Memory, Emotion, Will, Conscience, and Heart as they battle behind the scenes to control the Decision-Making-Process of one man,"Michael Sinclair..played by Brett Varvel." The quality of this film is amazing considering it is only their second production to date. Excellent acting, and special effects with a strong Christian Message. What makes this movie so astonishing is it's uniqueness in that "the story is different from probably any other movie you've ever seen." Creativity and special effects abound as the six members state their case behind the scenes and within one man. "House of Grace Films is dedicated to producing biblically based films to further the Great Commission. Movies are written, filmed, edited, and produced by House of Grace to promote the Gospel in a new way to a culture that is rapidly changing. We strive to use the highest professional quality standards of the industry in producing our films, and in so doing appeal to a broad spectrum of people who need to hear the gospel of Christ. Above all, we will share the love God evidences through His Son Jesus Christ." and/or Donate. Needless to say both films are listed on this site as our favorites and Congrats to Brett Varvel and the crew of "House of Grace Films" !!!! “The issues of the world must be met and met squarely. The “Forces of Evil” do not disdain preparation, they are always prepared and always preparing." "In Gramps' Shoes", a movie that just recently came to my attention. After watching it for the first time...my opinion is... "This movie has a wonderful Christian-Family-Message that perhaps all family members should see"! A single mother of two teenage kids is facing financial hardship and calls upon her father she hasn't spoken to for twenty years. Dad agrees to help and moves in with his daughter and grand kids for awhile. Immediately he begins to have an impact and becomes the father and grandfather they've been missing for years. His granddaughter welcomes him and they begin to forge a strong relationship. However, it becomes a much more difficult project with the teenage boy but in time their relationship becomes to warm-up. He begins to be known as "Gramps" and with his strong Christian faith finally leaves a lasting impression while providing many lessons for Godly and Responsible Living ! One thing that I need to mention...that you'll will notice almost from the beginning... this movie is not a High-Quality Production ! Acting and scenes aren't what I would consider representative of a Quality production, however, "The Content of this movie Supercedes the Quality of it's Production", and as you get into the movie, the viewer will "Warm-Up To It" and begin to embrace the actors and film. 2. The Song - This movie produced on location in Nashville, TN. and Kentucky, involves a male singer who writes a hit song resulting in a life of Stardom that puts pressure on his marriage. The Christian Movie industry is giving this one a good review and it is now playing in limited theaters throughout the nation. 3. Atlas Shruggs - Who is John Galt? Come to the movie and see !! This third part of Ayn Rand's Novel, about a futuristic society under a Fascist-American-Style-Government can now be seen at some limited theaters. 4. Left Behind - The new remake of Tim LaHaye's "Left Behind" movie will hit the theaters this weekend. Starring Nicholas Cage, and it will be interesting how this compares to the first one that starred Kirk Cameron released in the year 2000. 1. Pulpit Freedom Sunday Sunday October 5, 2014 - This Sunday is the day many Pastors throughout The USA will be "Preaching Political Sermons". Visit the website link above for additional Information. There is a new movie currently being shown in most theaters... A production centered around high school football and renown Coach, Bob Ladouceur, who lead the De LaSalle High School Spartens out of California to a Record 151-Game Winning Streak setting a record in American Sports. Nice movie but a "Very Intense Football Movie", so if you like the sport .. chances are you'll enjoy the movie. If not, you may still like it. The movie begins by introducing the team and their record success on the field, but things turn..The first game of their new season ends up in a devastating loss and is followed by another. Coach Ladouceur goes down with a heart attack. Their most "Mature and Promising Star Player" ends up being a victim of Gun Violence while picking up a fellow team mate at a downtown party. The team loses it's spirit and it's focus and struggles to regain it. Noted scenes: You'll see the LORD's Prayer being said by the team before a game and hear a few casual Bible Verses being quoted. You'll come-to-know that the intended purpose behind Coach Ladourceur system isn't just winning but developing his player's character for the future on and off the field ! Nice production, not so much a christian movie but a good well-produced family movie (with a little violence as mentioned above). Kendrick Brothers Have A New Release !!! !